Ancient people shared their traditions using myths and legends passed down by word of mouth. Stories of the stars in the night sky and the phases of the moon were told around the camp fire and predicted health, wealth, good fortune and love. Created using print and collage techniques by artist Jill Hedges, who has had a lifelong fascination with the moon and the stars, this charming little book takes love a few (million) miles further. 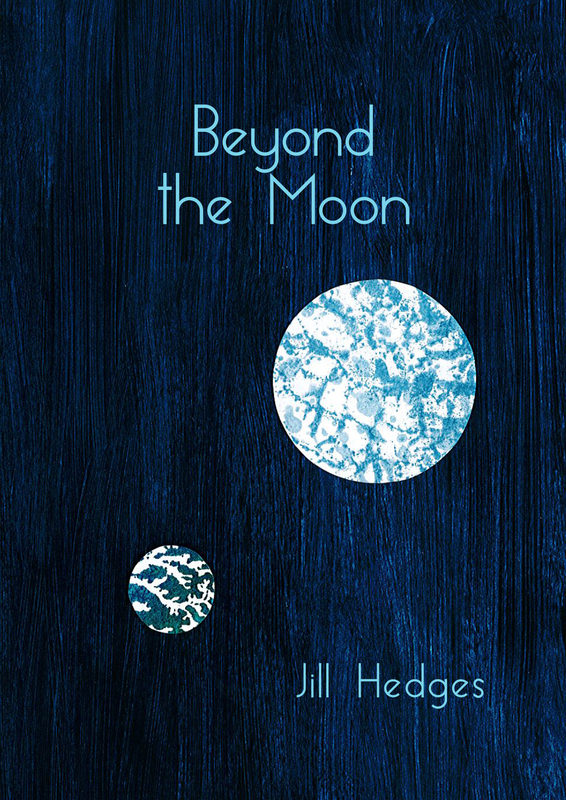 Jill Hedges has had a lifelong fascination with the Moon and the stars. She is an artist who naturally uses different materials and alternative art forms to convey her ideas. In 2015 she created A Space Walk map, an imaginative 5 kilometre walk that has conveniently scaled down the solar system to a manageable size. This map was first exhibited at the ‘On the map’ exhibition at the Sunbury Embroidery Gallery, Sunbury-on-Thames. In 2017 she published Christina’s Moon, a charming little chapbook that tells a tale of enduring love through the phases of the Moon. Hedges was one of the original artists behind Gallery 202, a contemporary artist led non-profit initiative based in Northamptonshire. Bringing contemporary art to rural and urban communities through exhibitions and artist involvement with the public.